Today is our 30th anniversary! To celebrate, Rob and I are going on a little trip to Long Island, NY. Ok, I know what some of you are thinking? Isn’t Long Island full of Levittown style track houses? Well, we’re going to the northern end, which we’re reaching by ferry from New London, CT. I’ll come back with pictures to show what we find. 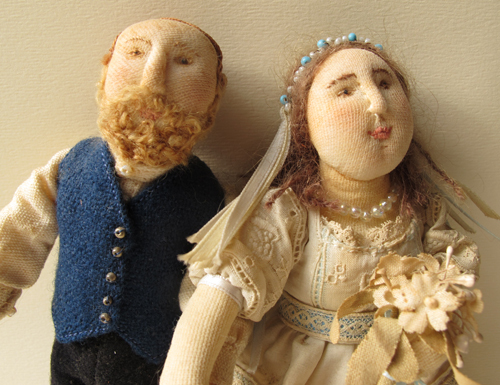 Anyway, I thought this would be a good opportunity to show the dolls I made for our wedding. 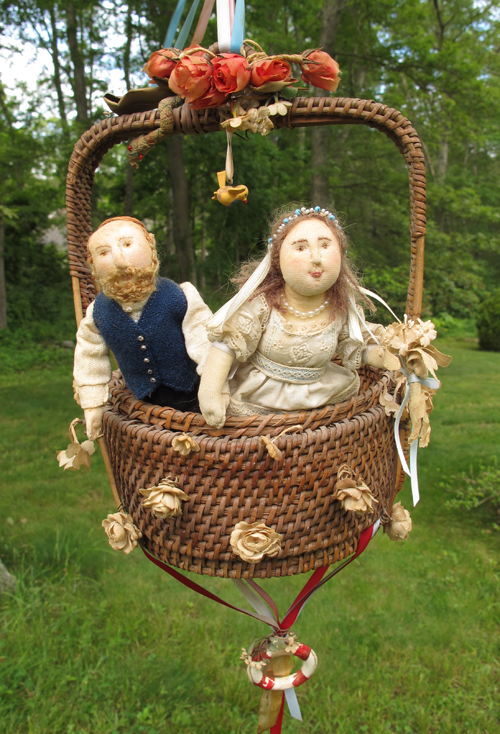 At the wedding, the dolls were hanging in a basket with helium balloons floating above and cheese cakes below. The dolls and basket have been gathering a coat of dust over the years, as we have also become gray. They were made with stuffed nylon stockings, which was all the rage back then. 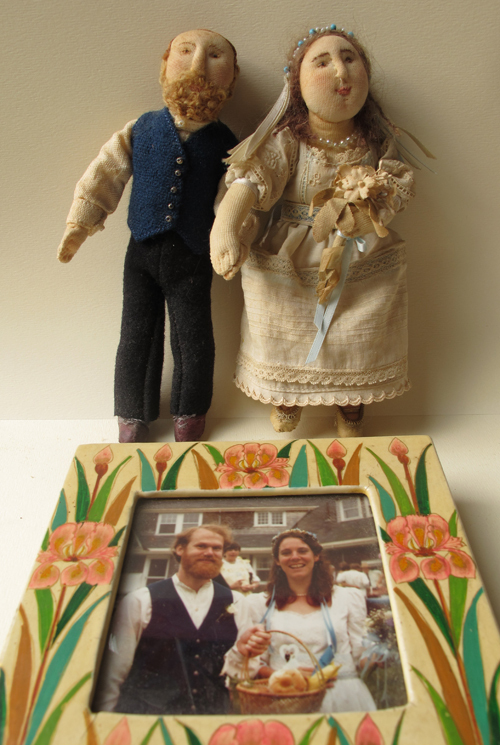 I made my own wedding dress and Rob’s shirt and vest, so the dolls had matching outfits. Happy summer solstice! 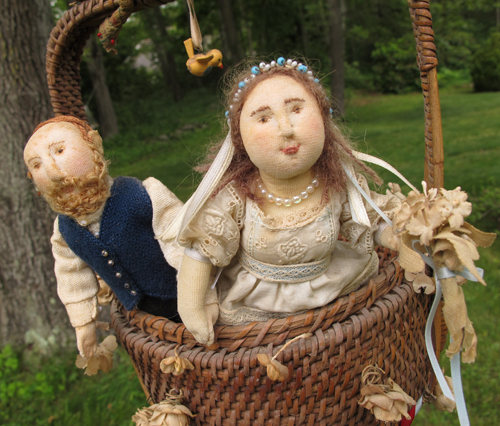 This entry was posted in Dolls, Family, Treasures by Salley Mavor. Bookmark the permalink. Oh what great memories and dolls. Have a wonderful trip and can’t wait to see the pictures. Happy Anniversary! How neat you will be going to Orient Point, LI, and points east today! I know this is corny–but I love that ferry trip. Wow–your bride and groom are just plain FABULOUS. You did a wonderful job and they have held up beautifully…like your marriage! The weather is beautiful In CT this morning. Have a wonderful day! Happy 30th wedding anniversary and enjoy your day on Long Island. It sounds like you’ll be visiting the quieter end of LI for sure! Blessings to you as you think about all that has happened in your 30 years together, and best wishes for many more! That sounds like the perfect way to spend the day. I haven’t been on the ferry to Long Island since I was a kid. I spent most of my early summers there, with my grandmother. I have heard that amagansett is not like it used to be. We are celebrating our 36th today, but staying home and paddling. Yesterday we went to Narrow river out to Narragansett bay. 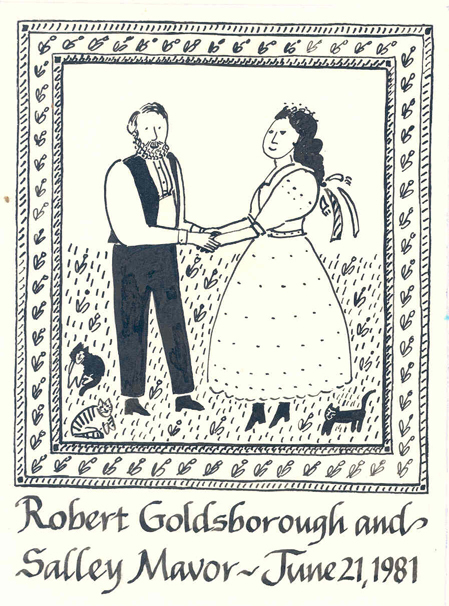 I hope you both have a wonderful time and Happy Anniversary! Wow! What sweet images and story. Thanks for sharing–and happy anniversary! Oh Salley ! How perfectly wonderful your special day must have been. Happy Anniversary and Best Wishes for at least 30 more years. Happy Anniversary. I grew up on Long Island, so I know it has many beautiful places and isn’t just Levittown from end to end–I am sure you will seek them out! I used to chug back and forth between Port Jefferson LI and Bridgeport CT on the Port Jeff ferry all the time for a span of 3 years when I was in college–back when it was actually the Port-Jefferson/Bridgeport Steamship company with an old old ferry with a single-screw propellor. My dad used to explain how hard it was to back the ferry out of the harbor every time we rode it–a fond memory. Say hello to the herring gulls and horseshoe crabs for me! And enjoy the start of your 31st year of wedded bliss! Happy 30th anniversary and I hope you have many more. I don’t know your area at all but I’m sure you’ll find the special places to visit. congrats!!! today is our 36th! How darling the dolls were at your wedding. Love seeing the “old” photo (have you beat by a lot….we just celebrated our 42nd anniversary last week) of your wedding. You have so many quaint things you’ve made to commemorate your life. That’s wonderful. Happy Anniversary and enjoy your trip!! Love the dolls. Hope you have a lovely time on LI. Happy 30th!!! So much joy in those stitches! Happy 30th anniversary! Your dolls were a joy to see. I remember stuffing dolls with old stockings in high school (dolls were donated to charity). Our 41st is coming up next week. Happy Anniversary! 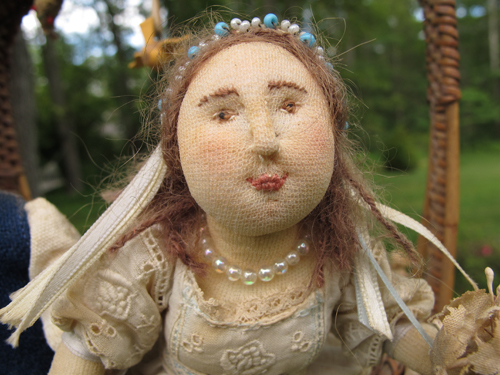 It seems that you’ve carried your creativity through every part of your life and these dolls are precious! I so admire your creativity! Happy Anniversary, Salley and Rob! Happy Anniversary! Our 12th wedding anniversary was yesterday! I also made my own dress, which nearly gave my mother apoplexy! She was fixing the hem for me the night before our wedding! A very happy anniversary to you! Have a nice trip!